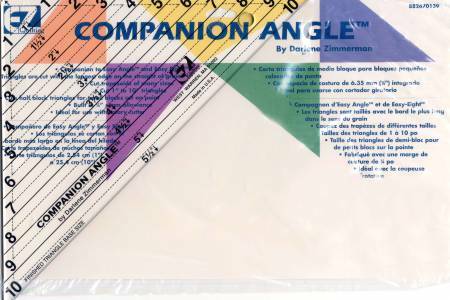 Companion to Easy Angle and Easy Eight. Triangles are cutwith the longest edge on the straight of grain. Cuttrapezoids of many sizes. Cut 1in to 10in triangles. Cutshalf block triangles for small blocks set on point. Built in1/4in seam allowance. Ideal for use with a rotary cutter.